Talk of a possible Apple-built vehicle dashboard has grown in recent months as Apple has forged a close partnership with Ferrari. This week, the luxury car maker revealed it is in talks with Apple about car infotainment systems, while Apple executive Eddy Cue joined Ferrari's board of directors last November. Apple's new car-centric job listings come as a number of vehicle makers have announced integration with iOS and Siri. Now AppleInsider has also discovered a series of recent job postings related to car integration for Apple's iOS platform. One such listing for an In-Car Software Quality Assurance Manager was posted by the company on Wednesday. "Apple is looking for a Software Quality Assurance Manager to drive iPod/iPhone/iPad integration testing with car stereos," the listing reads. "In this role you will be a hands-on manager, guiding the team to test car stereo compatibility with iOS products." The latest listing is joined by two more posted in late February seeking employees for the company's iOS Communication Applications Group, concentrating on "iOS Car Services." The available positions are related to application and framework development for Apple's mobile platform. The listings suggest that if Apple is in fact planning to push even further into the automotive space, the iOS platform would unsurprisingly be at the center of that initiative. While some vehicles have offered iPod integration with Apple's media players for years, the company renewed its automotive efforts last year when it announced Siri Eyes Free. The feature, built in to iOS 6, allows drivers to keep their hands on the steering wheel while controlling their phone entirely through voice. 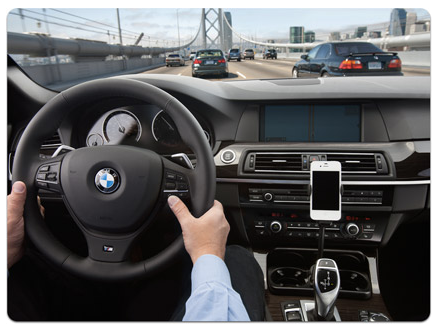 With Siri Hands Free, the iPhone screen stays turned off to not distract the driver. Since Siri talks back to a user out loud, drivers can control many functions on their iPhone with just the press of a button and the use of their voice. Apple showed a renewed interest in vehicle integration last year, with the debut of Siri Eyes Free support in iOS 6. A number of auto makers have already announced their support for Siri Eyes Free in their upcoming vehicles. And Ferrari also announced this week that its new FF coupe will have two iPad minis in the back seat for entertainment. While Apple's automotive push to date has been integration with its existing portable accessories, some have speculated that the iPhone maker could create an entire vehicle entertainment and navigation suite that would replace current offerings from car makers. Possibilities for new ways of integrating Apple devices in cars have also been revealed by the company's patent applications. One filing publicized last week showed a versatile magnetic stand that could hold an iPad from the ceiling of a vehicle to act as a navigation or entertainment system.